Industrial Bars | Classic Bars, Inc.
Industrial bars borrow design aesthetics reminiscent of old factories and other trade spaces for a vintage utilitarian look with modern sophistication. We combine high quality materials with stripped-back architecture to create a chic fixture that will help liven up your living space. Additionally, our Atlanta bar construction team can add additional features that are custom to your unique bar. Our professionals at Classic Bar, Inc. balance the natural elements of wood and metal in a way that embodies the industrial style offers. Our design team can also create beautiful industrial bars in residential homes that have convenient appliances like sinks, refrigerators, and dishwashers. 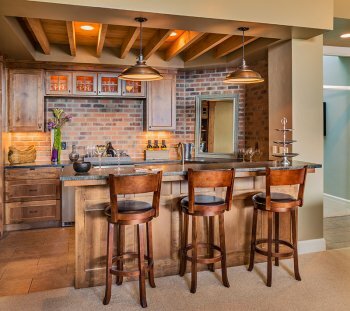 Impress your guests with a custom home bar tailored to your theme. Looking to find out more? Reach out to our offices by calling (404) 350-9806 to schedule time with our design experts.